After the excitement of OSCAL in Tirana, I travelled up to Prishtina, Kosovo, with some of Debian's new GSoC students. We don't always have so many students participating in the same location. Being able to meet with all of them for a coffee each morning gave some interesting insights into the challenges people face in these projects and things that communities can do to help new contributors. On the evening of 23 May, I attended a meeting at the Prishtina hackerspace where a wide range of topics, including future events, were discussed. There are many people who would like to repeat the successful Mini DebConf and Fedora Women's Day events from 2017. A wiki page has been created for planning but no date has been confirmed yet. On the following evening, 24 May, we had a joint meeting with SHRAK, the ham radio society of Kosovo, at the hackerspace. 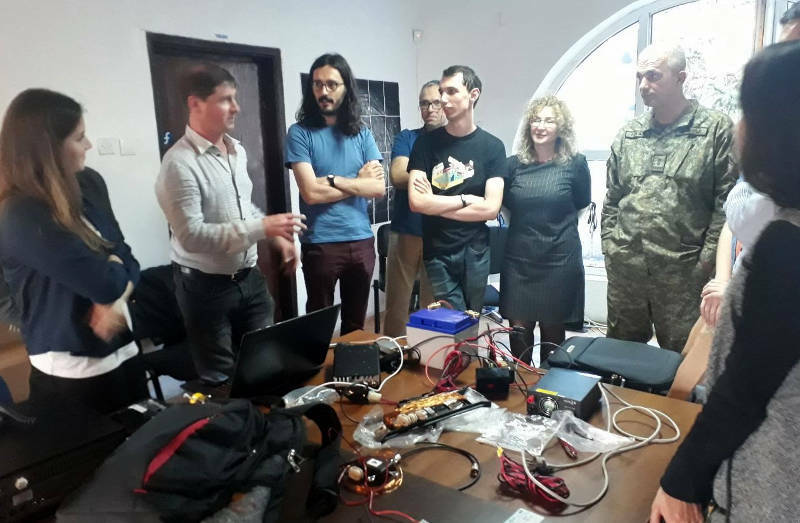 Acting director Vjollca Caka gave an introduction to the state of ham radio in the country and then we set up a joint demonstration using the equipment I brought for OSCAL. On my final night in Prishtina, we had a small gathering for dinner: Debian's three GSoC students, Elena, Enkelena and Diellza, Renata Gegaj, who completed Outreachy with the GNOME community and Qendresa Hoti, one of the organizers of last year's very successful hackathon for women in Prizren. One of the largest technology events in Kosovo, Doku:tech, will take place on 9-10 June. It is not too late for people from other free software communities to get involved, please contact the FLOSSK or Open Labs communities in the region if you have questions about how you can participate. A number of budget airlines, including WizzAir and Easyjet, now have regular flights to Kosovo and many larger free software organizations will consider requests for a travel grant.